It's gettin' hot in here! A triple-threat combo of hip-hop, RnB, and dance acts are causin' all the heat. Nelly, TLC & Flo Rida have joined forces and are on a hot concert trail. On Friday 30th August 2019, they're going to make fans go tgif! as they hit the stage of the Shoreline Amphitheatre. Everybody is in the mood to party like it's 2000! Tickets are on sale now. Fans have been chasing waterfalls…er…tickets to the show, non-stop. If you're too low…or rather slow, you might just miss out on all the fun. So make that quick shout out to everyone in the gang, and hurry, book your tickets now! The year 2000 was a hot year for music that ushered in a combo of hip-hop, RnB, and dance, that made every one bob their heads and shake their booties, with matching baggy sweat pants and frosted lip gloss. Fun and wild times indeed! Care for some rewind? 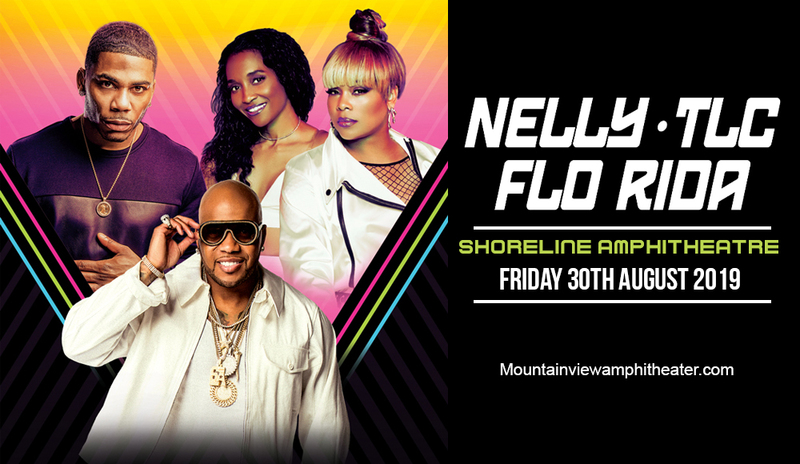 Live Nation has made this possible by bringing the party music icons – Nelly, TLC & Flo Rida in one stage, and bringing this triple-threat act in several key cities around the nation. The 21-city outing boasts of incredible, non-stop party with each artist delivering hit after hit all night long. His biggest hits include: "Hot in Here" – "Dilemma" [feat. Kelly Rowland] "Country Grammar" "Ride Wit Me" "Just a Dream"– "Cruise" — all of which have reached diamond sales and chart-topping status, and scaling over a total of 40 Million albums sold. Multi-platinum recording artist is just a portion of his expansive resume which include Grammy award-winning rap superstar, entrepreneur, philanthropist, and TV/Film actor. These three simple letters stand for one of the greatest music legacies in recorded music. Tionne "T-Boz" Watkins, Rozonda "Chilli" Thomas, and the late Lisa "Left Eye" Lopes, are icons in every sense of the word, and luminaries in the eyes of their adoring fans. TLC epitomized what it really means to be CrazySexyCool. With album sales of over 70 million records worldwide, their biggest hits "Waterfalls," "Creep," "No Scrubs," and "Unpretty," to name a few, have become immortal anthems of their generation and beyond. Flo Rida has sold well over 100 million singles worldwide. His lead single alone, the smashing 2007 RIAA 7x platinum seller, "Low (Feat. T-Pain)" – spent 10 consecutive weeks atop the Billboard "Hot 100". And since, he's had a solid string of platinum hits which include "Right Round (Feat. Ke$ha)" (5x platinum), "In The Ayer (Feat. will.i.am)" (2x platinum), "Club Can't Handle Me (Feat. David Guetta)," (3x platinum), "Good Feeling" (4x platinum), "Wild Ones (Feat. Sia)" (2x platinum), "Whistle" (2x platinum), and "I Cry" (2x platinum). Nuff said. It's time to just grab and go for those hot-to-handle tickets right here, right now!